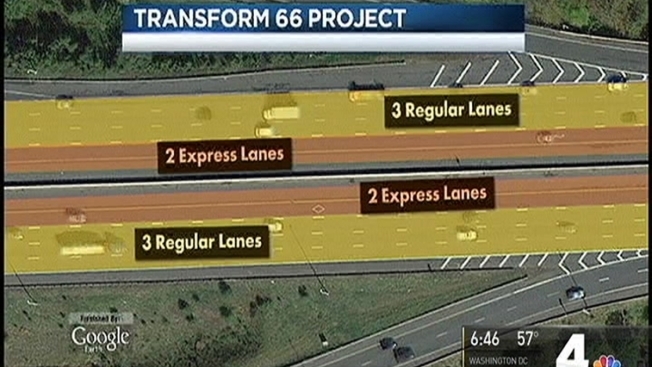 Traffic along Interstate 66 is going to get worse before it gets better as construction crews will be adding express lanes for the next four years. From the Capital Beltway to Gainesville, Virginia, state officials said travelers will have a better ride with the express lanes, which will run alongside three regular lanes. The construction will be extensive, taking some private property along the corridor. "It’s a lot of construction. $2 billion, roughly," said Susan Shaw, ‎Mega Projects Director and Design-Build Program Manager at Virginia Department of Transportation. "There are some total takes. Those are still anticipated with the project. We did minimize that. It is what we showed in our plans last year." The concept for the lanes is the same as the other express lane networks in the Washington area. Three or more people in the vehicle get to use the lanes for free. Those vehicles with fewer than three people will pay a toll that changes based on traffic conditions. Drivers are promised a speedy trip of at least 55 mph in the express lanes, including during rush hour. Virginia is contracting with a private company which will build, maintain and operate the lanes. Taxpayers won’t pay a dime for construction, but the private company gets to keep the tolls for the next 50 years.